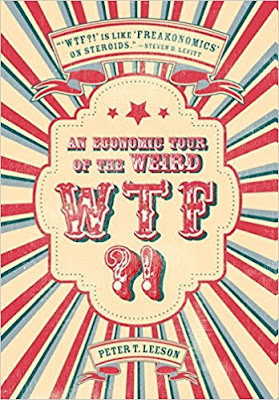 EconomicPolicyJournal.com: "WTF: An Economic History of the Weird"
"WTF: An Economic History of the Weird"
Peter T. Leeson,WTF: An Economic History of the Weird, CA: Stanford University Press, 2017. xiv + 246 Pages. $27.95 (paperback). weird. The book is structured as an eccentric tour hosted by the garrulous host (whose tongue is held firmly in cheek throughout). Accompanying the reader on this tour is the charming Ania (the author’s wife), a grumbling economist perennially disappointed at the lack of rigor and equations in the book, an angry priest,and a host of othercharacters who have minor walk-onparts. The tour encompasses many instants of unusual and seemingly bizarre institutions taken from history or anthropology. As each chapter or tour stop is based on one or more peer-reviewed article written by the author, there is intellectual substance to the entertainment. And it should be stressed from the outset that the book is entertaining. Leeson has set out to write a compulsively readable and accessible book. Many authors claim that theirwork could be enjoyably read by a non-academic,but unusually this book actually delivers on this promise. It certainly deserves popular success. Beyond being a breezy read, Leeson also raises some abiding and important social scientific questions. The promiseof the bookis that some of the most startling and odd instances of human behavior –including vermintrials in Renaissance Europe, trial by ordeal and battle in the middle ages, Gypsy rules of social defilement, and wife sales –can be explained through simple economic reasoning. Leeson’s tour deliverson this promise. This is some achievement given the apparent craziness of some of the institutionsunder study. But readers familiar with Leeson’s research will not be surprised that he is able to tease out how such social arrangementscan help resolve various social dilemmas. Let me take a specific chapter to illustrateLeeson’s reasoning. Renaissance France and Italy saw occasional trials of rats, locusts,and other pests for damaging costs. Several things are puzzling, not to say astonishing,about these trials. First, they seemed to be taken seriouslyby plaintiffs and courts alike. Second, the animal defendants were treated as if theywerefully rational humans with legal rightsand, for instance, given defense attorneys. Third,these trials didn’t take place in the early middle ages,but in the age of Leonardo da Vinci and Galileo. Leeson argues the vermin trials were closely linked to the problem of tax evasion. The Catholic Church was reliant on tithe payments—typically a tenth of agricultural output. But it was easy for farmers to understate this output and thus pay less taxes than they owed. Given the difficulties of monitoring this output directly in the preindustrial period, theChurch relied on supernatural punishments to sanction tithe evaders. As Leeson stresses throughout the book, such supernatural threats can be extremely potent. To the extent that the populace believed in these punishments, they would execute automatically and thus effectively deter evasion. How were vermin trials linked tothe problem of tithe evasion?